You wouldn’t expect to walk into a health food restaurant and be served a salad with no organic ingredients. The means would not be consistent with the ends, and you would distrust the company. A health food restaurant validates its interests in its consumer’s dietary choices by using organic ingredients in its dishes. Similarly, any company that markets its products to clients with certain values needs to make itself credible by creating its product in a manner that reflects the those same values. Here, sustainable construction is that salad, and sustainable forestry practices are the necessary organic ingredients. The creation of energy-efficient buildings is a vigorously growing facet of the construction industry (Wang & Toppinen, 2014, pg. 352). Because of growing concern for the environment, more and more establishments and companies are showing interest in erecting “green” buildings (Wang & Toppinen, 2014, pg.352). A major aspect of such construction, however, is utilizing materials that are likewise sustainable. Wood is one of the most sustainable materials, but can only be considered truly sustainable if it is harvested properly. If improper, ecologically-damaging practices, i.e. clearcutting, are used, the wood obtained cannot be considered truly sustainable. 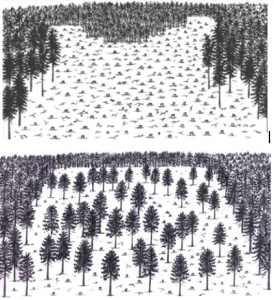 Yet clearcutting methods continue because they are economically efficient; being nonselective, the process is quick and less labor-intensive (Liu, Ruel, & Zhang, 2007, p. 149). In the end, the building that is erected may be energy-efficient, but it damaged local ecology in the process; how environmentally-friendly can we then consider that building to be? Alternative forestry practices, such as partial harvesting, facilitate the use of lumber for construction while creating far less ecological disturbance, making the wood obtained, and the building constructed, truly sustainable. The ability to obtain truly sustainable wood should be of increasing concern to contractors. Since there has been greater interest in sustainable construction, there is more awareness regarding the origin of the materials used. Contractors who work with clientele that want to build sustainably must gain credibility by using environmentally-friendly resources to build their “green” structures. Overall, wood is a more sustainable construction material than the current alternatives; using lumber retrieved primarily through partial harvesting rather than clearcutting would provide clients with a more sustainable and higher-quality building. The use of wood materials is more beneficial to the global environment both during and after construction when compared to typical concrete and steel structures (Nässén, Hedenus, Karlsson, & Holmberg, 2012, pg. 362). The biggest difference between construction with wood, steel, and concrete is the impact thetwo latter materials have on greenhouse gas emission, primarily carbon dioxide levels. The creation of non-wood building materials is an energy-intensive process that emits high levels of CO2 (Nässén, Hedenus, Karlsson, & Holmberg, 2012, pg. 363). Building with wood is a renewable and recyclable alternative; it promotes a healthier environment. Primarily, construction with lumber is more sustainable than typical concrete and steel construction because of the amount of CO2 emitted during the production of the man-made materials. CO2 is not even the largest greenhouse gas, in fact water vapor is. Water vapor levels heat and cool our planet, but the amount of water vapor in the atmosphere depends on temperature and CO2 changes temperature (it is a cycle). “In 2011, CO2 composed 84 percent of U.S. greenhouse gas emissions in the atmosphere according to the EPA” (Lallanilla, 2013, p.1). Now, construction obviously isn’t the only contributing factor to that 84%, but it does account for a portion, and we can reduce that portion by 14-31% if we create less concrete and steel (Lallanilla, 2013, p.1). CO2 is a harmful substance and doesn’t just go away, it stays in the atmosphere for thousands of years (Lallanilla, 2013, p.1). Wood actually captures carbon and stores it until the wood decays, or burns, which could be over 200 years from when the tree first sprouts. Part of building sustainably is creating a healthy environment and protecting our natural environment. CO2 effects may be looked at as natural, but the reason CO2 levels are so high is because of our way of living and producing. Greenhouse gases such as CO2 cause climate change and can alter the way we live our lives (Lallanilla, 2013, p.1). If we reduce our CO2 levels greatly now by incorporating wood structures into sustainable construction, we can create a healthier future. People may be scared to build large with wood because of fire or decay, but not to worry – the timbers are pressure treated as well as chemically treated to protect from damage. Wood structures are very strong and will be fire protected, while keeping CO2 levels low. Using wood in buildings requires a large amount less energy than building with steel and concrete. The low amount of energy wood requires is great for sustainability, even recycled wood requires much less energy than the typical concrete and steel materials. Renewability is very important. There is no concrete and steel growing out of the ground nor is it easily prepared to use in construction, but luckily many forests are ready to be partially cut and used in buildings. Energy used in production and construction of steel and concrete is much higher than that of wood. Steel requires five times more energy in production than wood and concrete requires 24 times more! Wood also uses much less energy to recycle because no heating or breaking down is necessary, it can just be thrown into a chipper and used as mulch. If not used for mulch it can be produced into wood products, which still requires less energy than melting and re-forming steel and crushing down concrete into pebbles. Building sustainably also means waste minimization, localization of materials, and biodiversity/ecology. When partial cutting is used to select high quality trees, it is used in local buildings when sustainability is the goal. These quality trees do not go to waste – scraps that are left over are used in wood products (particle board, pellets, laminated strand lumber,…) . When building structures composed of concrete and steel those materials are being transported from long distances, and between creating the concrete plus steel and transportation a lot more CO2 is created then if local wood was used to build. Wood structures also create a lot less pollution. Concrete/steel structures create 11% more air pollution and 2.5 (Wang & Toppinen, 2014, p. 355) times as much water pollution than wood structures. Building with wood overall is better for our environment and ecology. Building sustainably means creating structures while also exercising procedures that are environmentally conscientious and resource-efficient throughout a building’s life cycle (from design, construction, and even deconstruction) (Shi, Ye, Lu & Hu, 2014, p. 238). In order to build sustainably the best resources in doing so is wood, and logging wood by partial cutting is best because the best quality wood can be chosen while also keeping our ecology in good health. Wildlife that resides in New England forests rely on the maintenance of certain qualities of their environment. Certain species require a minimum amount of woody debris or canopy, for example, in order to reproduce or hunt. Partial harvesting and clearcutting are the subject of a fair amount of research in the forests of Maine, particularly in relation to their effect on wildlife populations. The results of these studies showed that partial harvesting is capable of sustaining a majority of wildlife populations; the numbers of animals collected in partially-harvested areas were statistically similar to those in free-growing forests. Those collected in clearcut areas were not (Fuller, Harrison, & Lachowski, 2004, p. 373-386; Patrick, Hunter, & Calhoun, 2006, p. 323-332). The coniferous and deciduous forests in the northeast region of the United States that are utilized for timber harvesting are also a primary habitat location for several species of small mammals and amphibians, including shrews, voles, and mice, and several species of frogs and salamanders (Fuller, Harrison, & Lachowski, 2004, p. 373; Patrick, Hunter, & Calhoun, 2006, p.324). These small mammals and amphibians are vitally important to the natural ecological balance of a forest system. As mentioned by Pearce and Venier (2004) in their study of such bioindicator species, they play an important role in controlling invertebrate populations by providing prey to forest predators; they also propagate the dispersal of spores, seeds, and propagules, and aid in the decomposition process of the forest floor by means of mixing the soil (p. 154). According to Pearce and Venier (2004), these species can be used to indicate the effectiveness of forestry practices. This ability is a direct result of the distinctive manner in which bioindicators respond to specific environmental disturbances, while their presence remains instrumental to the ecological health of the forest (p. 153). Sustainable harvesting practices aim to preserve the ecological integrity of the forest by limiting the amount of ecological disturbance as much as possible (Fuller, Harrison, & Lachowski, 2004, p. 373-386). The results of a study performed by Fuller, Harrison and Lachowski (2004) suggest that partial harvesting practices are able to maintain populations of small mammals in numbers similar to those found in mature uncut forests (p. 384). Furthermore, Patrick, Hunter, and Calhoun’s (2006) study found that several native frog and salamander populations are similarly sustained in partially-harvested forests because of the species’ increased likelihood of survival and decreased likelihood of migration out of the area (p. 324, 328-9). Conversely, when the bioindicator populations of a clearcut forest were compared to that of the mature unmanaged forests, the difference was evident across multiple studies. Fuller, Harrison and Lachowski (2004) noted a general and overall decrease in the abundance of small mammals in regenerating clearcut stands (p. 383). A study performed by Monthey and Soutiere (1985) documented a higher density of red-backed voles in regenerating clearcuts when compared to density in mature partially harvested and uncut stands (as cited in Fuller, Harrison & Lachowski, 2004, p. 383). Congruent to the aforementioned, Pearce and Venier (2004) conducted a study showing a dramatic increase in the abundance of mice after a clearcut, and observed the reciprocal effect in vole abundance (pp. 165-168). Patrick, Hunter, & Calhoun (2006) found a significant drop in the populations of wood frog, spotted salamander, and eastern red-backed salamander populations (p. 330).Both the 2004 and 2006 studies found that retained canopy and coarse woody debris were key indicators of population retention. Retention of these forest qualities is only possible in partial harvesting, and not clearcutting, methods (Fuller, Harrison, & Lachowski, 2004, p. 383; Patrick, Hunter, & Calhoun, 2006, p. 328). Therefore, it may be concluded that partial harvesting of mature forests is the least ecologically disruptive technique regarding timber harvesting in the northeast United States. Partial harvesting has shown to be a better method for gathering high quality wood. Strategically cutting down trees allows loggers to choose older, more mature trees that provide better wood for construction. Selective harvesting is a more environmentally friendly method of logging for wood. Itis the only method for creating and maintaining uneven-aged stands (Pacheco-Torgal, 2014). Individual trees or small groups of trees are harvested while minimizing damage to the residual stand. Pacheco-Torgal (2014) stated that small openings naturally regenerate by seed fall from surrounding trees. Group selection can be effective for providing visual and micro landscape diversity in young stand. Forest appearances change very little with this method, so it is valuable when aesthetics are extremely important (Pacheco-Torgal, 2014). Partial harvesting is the more expensive logging method compared to other procedures. Pacheco-Torgal (2014) noted that partial harvesting also requires more roads or skid trails than the other methods such as clear cutting or shelterwood method. Although this may not be appealing to the ecology, it does not harm the animals in any way. Thinning, a selective harvesting practice, allows poor quality trees or entire rows to be removed from young stands. The objective is not to create a new stand, but to provide more growing space for the older, more mature trees in the stand. Doing so, reduces the density to improve wildlife habitat or recreational opportunities, or to increase visual penetration into the stand and enhance aesthetic qualities (Pacheco-Torgal, 2014). When selective harvesting, it is useful to cut down the best trees available. Ideally, there would be several old-growth trees in forests that would allow high-quality, less defective wood for construction. Logs are selectively harvested around old-growth trees, whose durability and long connection with the ecosystem provide unique habitats for plants and animals. This method of logging is intended to preserve the ecosystem while still reaping the benefits of timber harvesting. Though selective harvesting can still cause habitat disruption, it has not proved drastically harmful to the ecology like the clearcutting method has. Ideally, older growth trees are preferred, as they make for better wood material. Tree quality is an important factor that is used to influence decisions made by foresters. Tree quality is often measured by assigning trees to potential grades. They are graded such as A, B, C, D or veneer, sawlog, pulpwood, fuelwood or bioenergy wood for presented or future predicted products based on external stem factors or attributes (Pacheco-Torgal, 2014). The purpose of selection harvesting or commercial thinning is to improve and rehabilitate tree quality. It is good for residual trees in terms of growth response, reduction of losses from mortality, silvicultural opportunities that improve stem quality, and value for future forest products. With all of these things to consider, forward-thinking contractors will embrace the idea of purchasing materials from loggers who utilize sustainable forestry practices, much like the restaurant buying vegetables from organic farmers. This will not only support the intent of green building, but it will also provide higher-quality lumber. Contractors who purchase this partially-harvested lumber can market themselves as such, and gain an edge over others who are not using sustainably-sourced materials. Some contractors might question the necessity of seeking out sustainable logging companies, because some legislation is already in place to put parameters and new growth policies on clearcut land. For several reasons, however, these policies are not enough to ensure that contractors are receiving truly sustainable materials. It was recently made public that J.D. Irving Ltd, Maine’s largest private landowner, signed a contract with the state of Maine that exempted them from undisclosed laws of the Maine Forest Practices Act (Mistler, 2013, p. 1). This means that J.D. Irving Ltd’s 1.25 million acres of land are not held to the same standards of other maine logging companies, and what standards they are held to are unknown; there is no way to guarantee that the lumber obtained from this massive amount of acreage is truly sustainable. Even companies which do adhere to the Maine Forest Practices Act are not necessarily practicing sustainable methods; Chapter 20 of the Maine Forest Practices Act sets guidelines for clearcutting, including a maximum area of 250 acres (Maine Forest Practice Act Rules, 2014, p. 10). As discussed earlier, clearcutting is detrimental to wildlife, especially in such large areas. In fact, the average acreage used to study clearcutting effects in the aforementioned wildlife studies was 138 acres (Fuller, Harrison, & Lachowski, 2004, p. 375; Patrick, Hunter, & Calhoun, 2006, p. 325).This means that even companies working within state limits are not necessarily producing truly sustainable lumber. Therefore, the initiative must be taken to find products which are sustainably sourced. Providing these products to clients is a serious marketing tool, and the underlying costs could be reconciled. Much of the concern with sustainable forestry practices is derived from the financial investment. Because partial-harvesting is more labor-intensive, the cost of wood obtained through these methods does come at a premium price (Liu, Ruel, & Zhang, 2007, p. 149). However, if we are returning to our original metaphor, a customer who walks into a health food restaurant expects to pay a premium due to the well-known higher cost of organic ingredients. Clientele who are interested in building sustainably are already willing to make a higher cost investment for the good of the environment; their interests, values, and corresponding budget are known. It stands to reason that a client willing to pay a premium for a sustainable building would be likely to pay a larger premium for a truly sustainable building. Marketing in order to appeal to clientele would be key, but knowing their interests and values align with sustainable forestry practices is more than half the battle. The formula for truly sustainable construction includes sustainable materials that are sustainably sourced. Lumber is most environmentally-friendly material, from production to deconstruction, and partial harvesting is the most sustainable method of retrieval. This formula, when explained and proposed to clients, will allow them to make choices and investments that best suit their values. Therefore, forward-thinking contractors in this market will be the first to get behind this movement. The movement toward using partially-harvested lumber is in the best interest of business owners and the New England forests.